We were just up in Nantucket for gobble week, and though it was beautiful as always, the sun set too early and it was chilly. It left me longing for warm summer days with beautiful light til 8pm–which was the case for this adorable family’s summer portrait session. 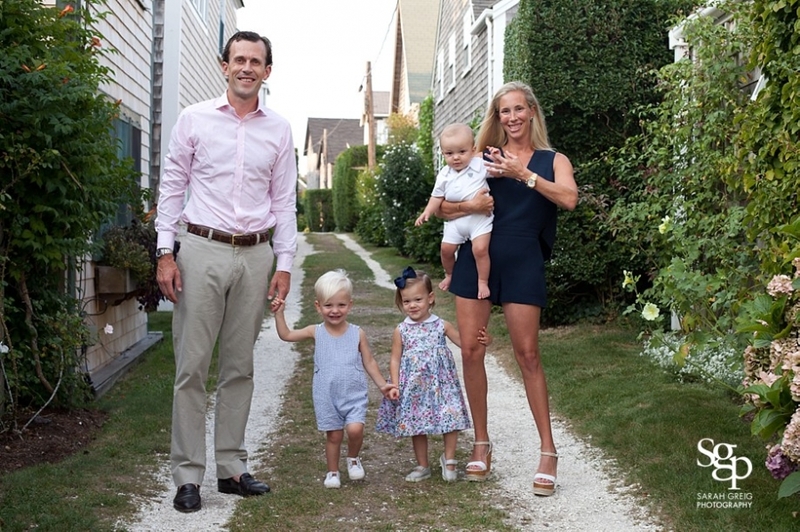 The Artemenkos were on Nantucket for a family wedding, and I’m so glad we were able to fit a session into their wedding week schedule. With three children under the age of 2.5–twins and a 9 month old–I knew this one would be a fun and high energy session! I love when parents are great planners, and their mom consulted with me about their adorable outfit choices as they packed for the trip. We settled on pinks, whites, and blues and everyone looked great. We met in front of the famed Siasconset Market (don’t miss their hot blueberry muffins every morning) and then tucked away into my favorite little nearby lanes. Those charming streets are on a short list of my favorite places in all of New England. Once the light softened, we headed down to the beach for some sand and sunset. 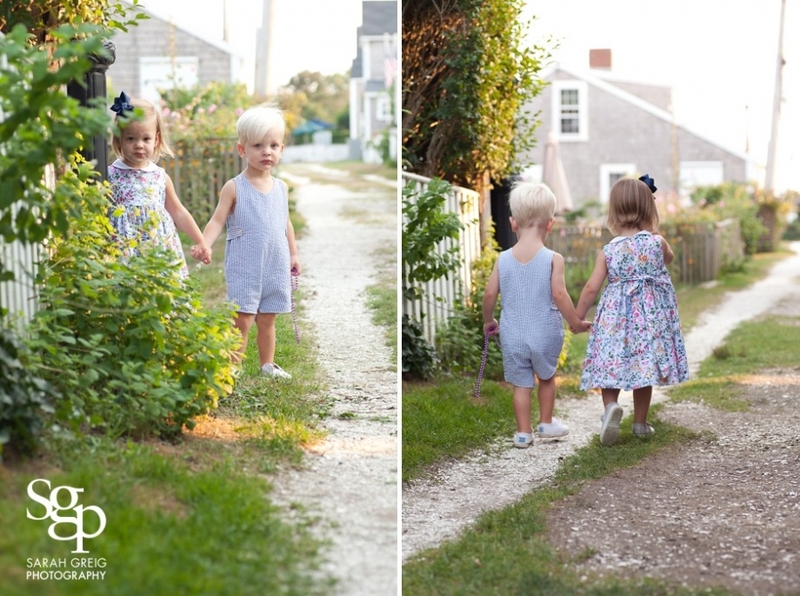 At one point, the twins decided to walk down the lane toward the market (ice cream anyone?) and I snapped away as they strolled and held hands. They then peeked back at me through the bushes, which resulted in a few of my favorite images from the evening. Their little brother was full of smiles and loved interacting with his older siblings. As it turned out, this was my last session of the summer. Less than 12 hours later, I got appendicitis and had get medivaced to Boston for emergency surgery. Yikes. I’m so happy we fit this session in! KC, B, W, D, and T–thanks for a wonderful session and hope to see you in NJ soon! Last call for photo prints that are guaranteed for Christmas! Orders must be placed by midnight on Friday, December 4th! It’s been exactly a year since we had a crazy experience last fall, and I am finally ready to write about it. I haven’t written many personal posts recently, but it’s been a doozy of a year. My second daughter was born on September 27, 2014. I knew I’d take some time away from my business when I had a newborn on my hands and a toddler running around, but I never imagined the kind of fall we’d have. It wasn’t filled with the eagerly anticipated snuggles, swaddles, and joy; but rather, stress, throw up, and bone-deep fatigue. A year ago this week, I found myself sitting in a tiny partitioned area of a hospital room at 3 a.m., using a borrowed breast pump to extract milk for the umpteenth time that day, and listening to a Law and Order SVU marathon blaring too loudly on the other side of the curtain in our shared room. Next to me lay my six-week-old daughter, hooked up to an IV with two new incisions on her stomach from surgery, and her swollen belly button flipped upward and sewn closed. It’s hard to describe what it feels like to see your tiny baby occupy about 1/20th of a hospital bed while hooked up to machines that incessantly send off unnecessary alarms. Horrible. Scary. Unfair. Sad. Now add sharing a hospital room with another new baby who cried and threw up all the time. Exhausted. Frustrated. Pissed. And wondering: how did I get here? We brought our newborn home last fall and she slept a lot. It seemed like she also ate a lot, yet she didn’t gain weight. When she was four days old, we trekked across town in the warm fall rain to take her to the ENT to have her frenulum cut–it helps babies latch and lift their tongue better to help with breastfeeding. We had to do it with our older daughter as well. But the frenulum healed so well that it reattached itself a week later, so we returned and had it cut again. Yet she still didn’t gain weight. Our pediatrician shifted strategies and took her off the breast and we did all bottle-feeding for 10 days to try to get those calories in her. Which in theory sounds like a good idea, but in practice meant I was chained to the breast pump–morning, noon, night, and later at night. I was miserable. So was the baby. My husband, who was a saint during all of this, called himself “the baba man” for all of the bottles he gave the baby. And then, just when we thought it couldn’t get harder, at around 4 weeks old, our newborn started throwing up after feedings. And not just “spit-up” or “reflux” that every oh-so-wise and well-intended person would tell us that it was; rather, she could spew it out in an arc. It was impressive, really. Sometimes while she was napping, her eyes would shoot open and look surprised as she immediately threw up. It got to the point where I dreaded feeding her and our entire living room was covered in towels. She seemed lethargic and sad. She looked hungry though she was eating a lot. We knew this was not normal. If you’re a parent and you feel like this–listen to your gut. At 6 weeks old, she was still not back to her birth weight of 7lb 6 oz. After a weekend trip filled with throw up and frustration, we took her back to our pediatrician for a weight check, and she had lost weight since our last visit a few days prior. We pushed for an ultrasound and she agreed, which took place on a Monday at 4pm. By 5pm, they sent us to the Pediatric ER at Morgan Stanley Children’s Hospital at New York Presbyterian for emergency surgery. As I had suspected from all of my overzealous googling at 3am, she had pyloric stenosis. Her pyloric muscle had become so thick that it wasn’t allowing food to pass from her stomach to her small intestine. Milk was just sent back up and out–with force. This causes severe dehydration and more as you can’t keep any milk down. We decided that we should buy a lotto ticket because this condition occurs in 3 out of 1,000 babies in the United States. It’s about four times more likely to occur in firstborn male infants and also has been shown to run in families. She is neither first born or a boy, n’or does she have a family history of it–some odds! Due to some crazy hospital shenanigans, they didn’t operate right away. While I was home with our toddler, my husband spent a long, terrible night in the ER triage area surrounded by stabbing victims, drunk people, and screaming children (including our own). Early in the morning, they finally moved us to a real (yet shared) room in the hospital, and we thought we’d have the emergency surgery right away. We pulled our toddler out of school and shipped her off to our wonderful family in NJ and then CT. Then we waited. And waited. We were an “add-in” surgery and they just never fit us in. Did I mention that they wouldn’t allow the baby to eat while we were waiting for surgery…for 26 hours. Newborns eat every 1.5 to 2 hours. It was outrageous and she knew it as well. That part was actually the cruelest. Our pediatrician called and tried to convince them to let us feed her a little, since we still had no scheduled surgical slot. They told her no way. It was as if no one realized that the patient they kept pushing off of the schedule was a six-week-old baby who hadn’t eaten in hours. She hollered off and on in our tiny hospital room, likely wondering why the hell we wouldn’t feed her. It was beyond horrible. We were allowed to put sugar water on the end of her pacifier to placate her but she was not fooled–she wanted real food. Getting iv fluids was not the same thing. After awhile, they said no more sugar water, and I couldn’t keep her quiet despite being in a shared room. Finally, after pleading/crying to anyone who would listen and some championing (aka incessantly calling the surgical floor on our behalf) from our amazing nurse–who we discovered had played football against my husband in college–we were given a 5pm surgical slot, which was a full day after we had arrived at the Emergency Room for surgery. We put on green hospital jumpsuits (finding some humor in this as my 6’6” husband could barely walk in his) headed to the surgical floor. The doctors talked over the procedure and we were allowed to wheel her most of the way to the operating room. The actual surgery wasn’t long–about an hour–but putting a 6.5 lb baby to sleep safely and waking them up after surgery is tricky. Thus, the anesthesiologists take their time, so they told us we could be waiting about 2.5 hours. We found the Keurig machine in the waiting area and brewed large cups of coffee for our tired selves. At that point I was so relieved that the surgery was finally happening, that I wasn’t even that anxious. As I said a prayer, it also occurred to me that we hadn’t yet had her baptized and that we were terrible Catholics. But we were in good hands with a surgeon (a fellow Tufts Jumbo) who had years of experience with this particular surgery. The procedure has to be exact, as they have to make the incision in the pyloric muscle not too large that it cuts open, but not too small that it doesn’t release at all and eventually allow food though. After a long two hours, she came through the operation with flying colors. That evening as we left the recovery room, we were slowly allowed to introduce milk to her–half an ounce at a time every two hours. By the time we fed her the first half an ounce, she had gone over 30 hours without food. She hungrily sucked it down and wanted more­–but we could only give small amounts. She screamed off and on all night as she was starving. I sent my husband home to sleep and it was a long long night between trying to feed her, pumping, and managing the crying. Our neighbor’s night nurse was irritated and made crazy suggestions like unhooking all of the wires and taking my baby down the hallway for a walk, which at one point I did. I was so deliriously tired I had no idea what I was doing. They would let us go home when she kept down three feedings in a row, so with each 2 hour interval, we crossed our fingers that she would keep the milk down. The next day, just as they were about to release us, she threw up one of her feedings. Ugh. This was fairly normal as the pyloric muscle doesn’t relax for a few days, even a few weeks after surgery, and thus still doesn’t allow much food through. But the vomiting delayed our being released by several hours and I was dying to get out of that horrible hospital room. When we finally made it home later that day, the recovery was slow. Our home was still covered in towels, as she continued to throw up until her stomach healed. We wondered if the surgeon hadn’t cut enough, if we might have to have the operation again. Needless to say, it was a crazy blur of a fall. People told me it was one of the most beautiful ones we’ve had in NYC–warm days, beautiful foliage…but I had no idea. We were just living in a fog­ and operating on a sleep deficit that was greater than I’d ever experienced, even with my first child. Getting my toddler dressed and to school on time was an accomplishment. So was showering. I still lived on the breast pump, as she wasn’t able to extract enough milk from the breast until mid-December, when she was 2.5 months old. We just put one foot in front of the other and limped through to Christmas, feeling as though we had been on a 3-month bender. The whole situation also really put things into perspective–granted, our experience was scary, but we had a clear diagnosis and a solution that would have no lasting impact on her future. We were lucky. At the hospital, we were surrounded by other children who had more severe illnesses. Families in other rooms received bad news. We shared our hospital room with a four-week-old baby who couldn’t keep down any feedings but they couldn’t figure out why. Her family went home every night to their older child and left the baby with a night nurse. They planned to be at the hospital for the long haul–through the Thanksgiving holiday and beyond. I could barely handle it for 3 nights–I have no idea how people gather the mental strength and stamina to do it for longer. The surgical and emergency room system at the hospital was flawed–and that’s putting it nicely. I’m not even sure I could call it a system. I found it infuriating that it was so difficult to be put on a schedule to receive an emergency surgery. For a newborn. If they couldn’t operate, they should have just scheduled a time, let us take her home and feed her, and come back when the surgery was scheduled. The left hand wasn’t talking to the right hand. The nurses didn’t coordinate with the doctors, and they wouldn’t honor any input from our pediatrician. They even had to re-do the one-hour ultrasound (during which you have to keep your baby still and lying flat) that was completed four hours earlier at a different hospital because the radiologist at the first hospital had gone home and they couldn’t get him to send over the file. Seriously. We were hugely unimpressed. Their universal lack of coordination made the situation 100 times worse and insanely stressful. In the end, she’s healthy. I can’t believe it was a year ago. When her stomach eventually healed, she gained weight and has never looked back. In fact, she eats more than her sister. I’m so grateful to live in a time when this was a simple surgery and she can thrive and grow. She now walks, climbs, and chases her sister all over the place at lightning speed. She has a great laugh and is generally a very happy thirteen-month-old. We never want to relive the Fall of 2014, but it does make us more grateful than ever for our healthy children. And for health insurance! I just had my appendix out in September (which is a whole other crazy story for another time and involves a helicopter medivac off of an island with no surgeon), so now my 1-year-old and I have matching scars from laparoscopic surgery! Here’s to a healthier 2016 with fewer medical bills, and to experiences like this only making us stronger. A few weekends ago on one of those perfect fall Sundays, I had the pleasure of meeting E and E in Brooklyn Bridge Park for a fun portrait session. The photos were a surprise gift to their grandma for her birthday–how adorable is that? Grandparents just LOVE photo gifts…and I heard these were a hit! I had so much fun with these gals, ages 4 and 2, who ran around the fields at Brooklyn Bridge Park and along the gorgeous waterfront. E and E have a really sweet dynamic together. I have two little girls of similar ages, so it was fun to observe these sisters’ interactions. And their blue blue eyes…OH MY goodness! Thanks to their mom and dad for providing some laughter (and stuffed animal props) as we photographed their gals. Eleanor later told her mom that taking photos with me was the highlight of her day. How nice is that? 🙂 Right back at ya girl! I’m so glad that the photos were a hit and I hope to see you all again soon! I’ve been remiss in posting these in a timely manner-sometimes life gets in the way of my intended fun blog posts! But we’re finally heading back Down Under to Tassie today for more recommended Aussie adventures. (Check out more about this series in honor of our two year anniversary of moving Down Under). Tasmania sounds like one of those places you’ve heard of but aren’t really sure where it is. Famous for its devil (now endangered) and a quick flight from Sydney and Melbourne, everyone plans their trip there to be in the historic capital city, Hobart, for their famous Saturday market at Salamanca Place. We have farmers’ markets in NYC as well as craft fairs, but this one is really kicked up a notch–the flower stands had arrangements straight out of Martha Stewart Living, friendly vendors sold gorgeous and high quality children’s clothing as well as beautiful handmade cutting boards made of various local wood, and the fruit and veggie stands provided a visual rainbow of fresh culinary options. We even met a children’s book author selling some wonderful Aussie storybooks that he autographed for my nieces and nephews. Our morning at the market was gray with a light misty rain, but it didn’t detract from being an experience I’d love to revisit! Tasmania is an island and state located 150 miles south of the Australian mainland. Nearly half of the island is composed of national parks, reserves, and world heritage sites. Hobart, its capital, is full of 1830’s Georgian style warehouses and has been described as “a mashup of the 19th and 21st centuries”. Stay in the area near Salamanca Place, a charming area surrounded by four story historic sandstone buildings and old warehouses. Hit up the Farmer’s Market early, grab your (delicious and amazing) Australian coffee, and just wander. Bring cash and go bananas- and remember you can bargain for some items. You can get to Tassie by overnight ferry (11 hours) across the Bass Strait from the Australian mainland, or by a quick flight from Melbourne or Sydney. Time your trip to be in Hobart for the Salamanca Market, which runs on Saturdays from 8:30 a.m.- 3:00 p.m. Be sure to wander about hilly yet walkable Hobart, full of beautiful architecture, great restaurants and sidewalk cafes, and gorgeous vistas of the harbor. For a real treat, head down to the harbor take the (very cool and tricked out) ferry to MONA, a unique contemporary art space. Spend an afternoon among art and grab lunch in this dockside contemporary building. For travels beyond Hobart, don’t miss the stunning Freycinet National Park and its famous Wineglass Bay, Cradle Mountain, and the gorgeous drives in between. © 2019 Sarah Greig Photography|ProPhoto Photo Website by NetRivet, Inc.